Happy Sunday! I hope everyone is having a great weekend :) It’s been a lazy and slow weekend for me. 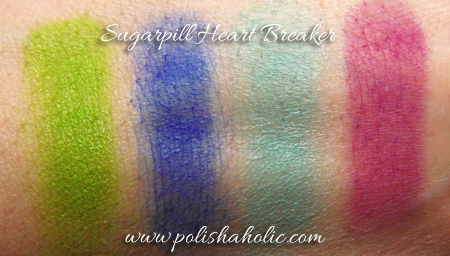 This time I have swatches of Sugarpill Reckless Loose Eyeshadow Trio for you. 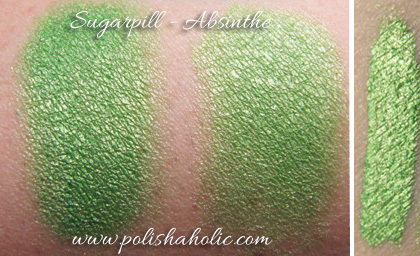 This package has Absinthe, Starling and Stella eyeshadows. I swatched these over Urban Decay Primer Potion Original on the left and GOSH cream eyeshadow stick on the right. 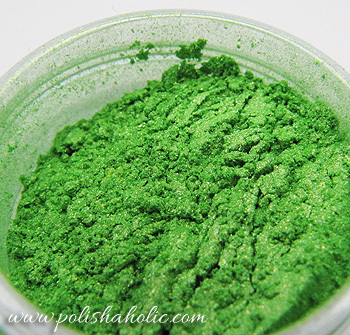 Separate swatch on the right side is with Make Up Store Mixing Liguid which can be used to make your loose eyeshadow work as an eyeliner. 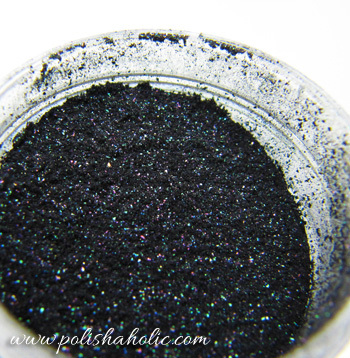 UDPP seemed to work better than the cream eyeshadow and brought out the best in these shadows. These apply silky smooth and the result is very shiny. You can buy these as a trio or one at a time from Sugarpillshop. 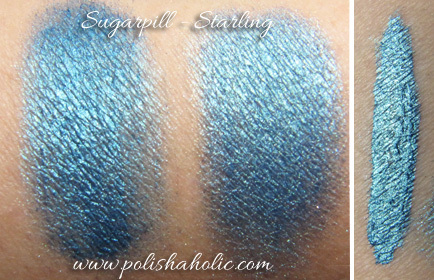 Today I have Sugarpill 4-Color eyeshadow palette swatches for you. 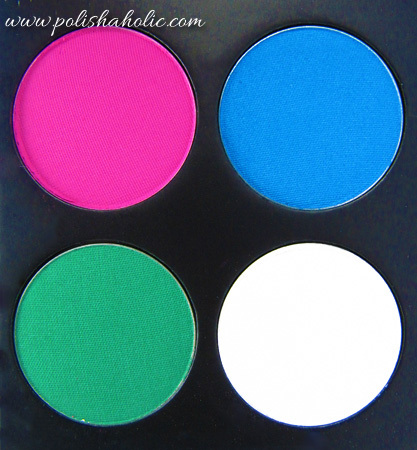 I’m totally in love with Sugarpill makeup and I have all three 4-Color palettes along with a pile of their loose eyeshadows. The color range is bright and in your face awesome! 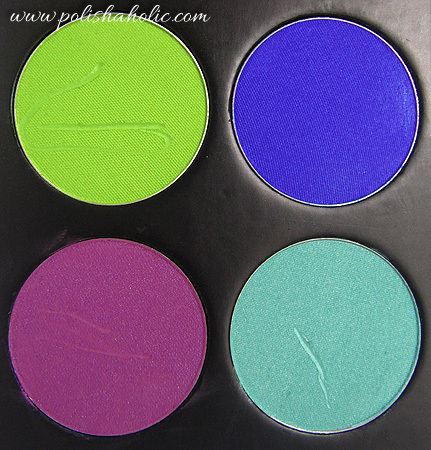 Online you can see a lot of crazy colorful and intense looks made using these eyeshadows. Though I think using these colors for everyday look is perfectly fine too. 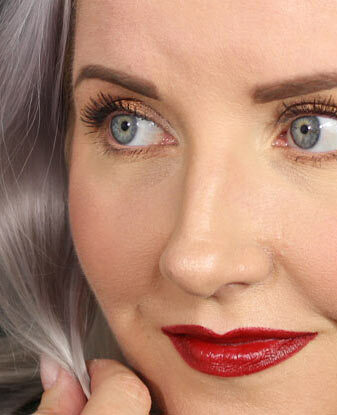 Just apply with a light hand and you don’t have to use all four shades in a same look. 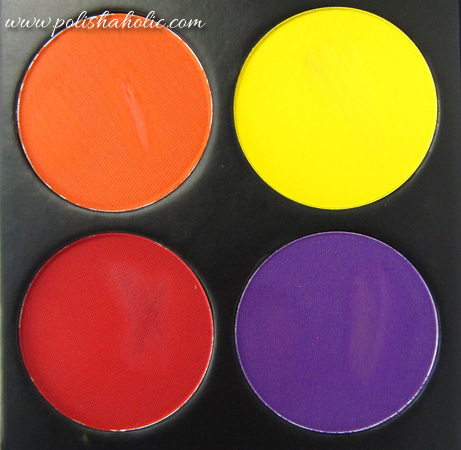 Don’t let the bold and bright colors intimidate you, just give them a change to brighten up your day! I will be doing and photographing a variety of lighter everyday looks with these eyeshadows for you and on some future Sunday I’ll write a post about those. 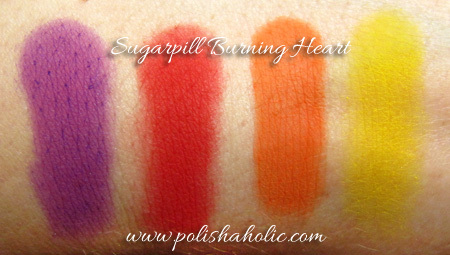 You have any of Sugarpill eyeshadows? 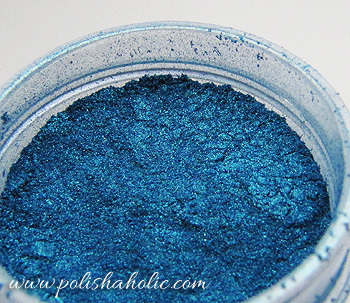 Are you interested in these intense, bright shades or do you rather invest your money on a safer color choices? 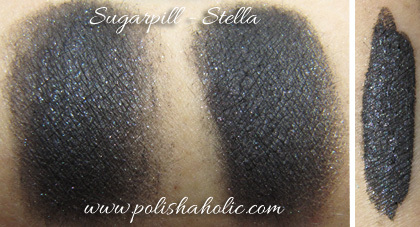 You can buy these and other eyeshadows from their online store, Sugarpillshop.